I finished Wait for You a few weeks ago but allowed it to sit in because I wasn't sure of my overall conclusion. In the beginning of the story, I was very entertained and pulled in. It seemed like something I would enjoy. But then there were these little things that started to bug me. Like Cameron's use of the word "sweetheart". I hated how often that word came up and I wish it had been "babe" or maybe nothing at all. Then there was the whole past that Avery was concealing. I thought that she kept that hidden for too long and it annoyed me how Cameron was so open yet she was still keeping secrets. It seemed like it was all for the drama, one that I felt to be unnecessary. Like I said, the story was initially interesting, and I liked the way Cameron and Avery were with each other, but after the middle it started to prolong too much. Another thing I have to point out (even though I usually don't because my own books and posts are far from perfect) is the fact that there were quite a few typos throughout the book. The reason why I mentioned that is because the book is published by an imprint of HarperCollins and even though typos are found in nearly every single book, I wasn't expecting that much in one that was traditionally published. 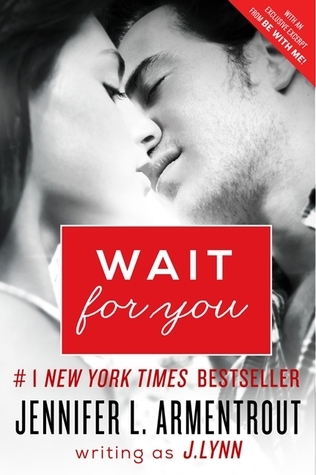 I still gave Wait for You three stars because I liked the writing (in spite of the instances of typos), and there were moments between the characters that I enjoyed. It seems like an interesting series and I'm curious about the second book which focuses on Cameron's sister and friend. I agree about the withholding of the secret too long. For sure. I liked this book, but it's definitely my least favorite. Trust in Me was really good, Be With Me (Jase and Teresa's book) was wonderful. I'm glad the second was good. I'll pick it up soon. Thanks for stopping by Drea. I am just burned out on the whole NA genre because too many seem to fall into the same old same old story line and this one seems to be in that rut. Wow! Disappointing to hear there were so many typos in such in a finished copy. I know what you mean. But there are some in the pile that are different in a sense. Yeah, I was kind of surprised since this I bought it on Amazon and it's traditionally published. I have yet to try one of her adult books I think because so many people haven't like them like they have her YA series. I am sure eventually I will but for now I am just happy reading whatever she writes in the YA genre. Seems like her YA books are better. I'll have to give them a try.